Stephen Trampe, a Senior at Hillsborough High School and a member of Boy Scout Troop 89, has recently earned the rank of Eagle Scout. Stephen’s Eagle Scout Project consisted of constructing a steel shed to house a community emergency response trailer and items for the Somerset Community Garden. The project involved 147 hours of labor by 14 scouts and adults. Stephen served as Senior Patrol Leader, Assistant Senior Patrol Leader, Patrol Leader, Troop Guide, and is a member of the Order of the Arrow Scouting Honor Society. He is a member of the Hillsborough High School National Honor Society, High School Marching Band, and a varsity athlete in the spring and winter Hillsborough High School Track team. Stephen serves as an example to the youth of Hillsborough Township through his high level of leadership and community service, and Hillsborough is fortunate to have him as a member of our community. 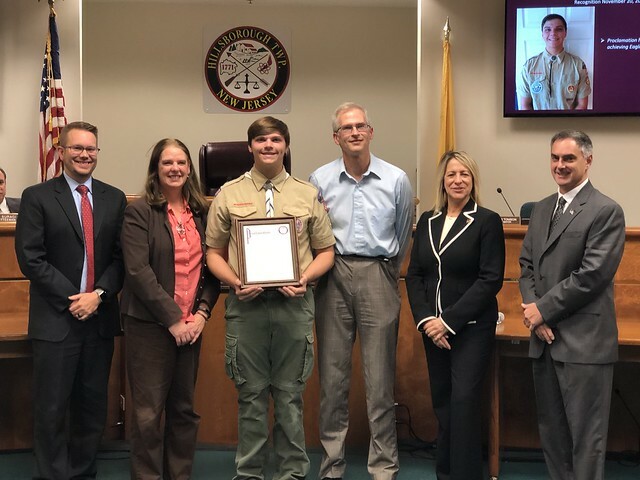 The Mayor Township Committee congratulate Stephen Trampe for having achieved the status of Eagle Scout, an honor for both him and for those who guided him, and extend their best wishes to him for a bright and successful future.